Canada takes great pride in participating in the Olympics. While there are many different events that they take part in, sailing qualifies as one of the most exciting. While Canadian sailing Athletes make an impressive showing at every sailing event in the Olympics, many will refer back to the 1988 Seoul games for the sailing competition. Lawrence Lemieux could smell victory as he inched towards becoming a medalist. But, lending a helping hand became more important to this athlete instead of being an Olympic champion. Lawrence stopped his race to assist the Singapore sailors who had capsized during the event. Although this potentially cost Lawrence his medal, he has presented an award for his bravery. To recognize the first sailing win for Canada one has to go back to 1932 when the event was held in Los Angeles. The two events that Canada played in were the 8 meters in which the country picked a silver medal the 6 meters where they won a bronze. Unfortunately, a good many years would pass before Canada would enjoy the podium again for its success in sailing. This took place in 1972 at the Munich games. Moving up in time the latest win was in 2004 in Athens. Mike Wolfs was the proud athlete who brought the silver medal home to Canada. Although Canada has never picked up the gold medal for sailing, the athletes participating in this sport are very proud of the 3 silvers and the 6 bronzes that they have earned. For those who believe in omens then perhaps sailing being the first sport to qualify Canada for the next Olympics will be considered as one. Ten Olympic fleets entered the 2018 Hempel Sailing World Championships Aarhus in Denmark. This was the country qualifier for those with hopes of qualifying for the 2020 Olympics. The outcome was Tom Ramshaw and Sarah Douglas, both members of the Canadian Sailing Team earning Finn and Laser Radial spots in the 2020 Olympics. Tom took the 5th winning position. Sarah was placed 6th overall. It isn’t just the local competitions that draw the enthusiasm of those who enjoy sailing beyond the point of just recreation or entertainment. It’s the Olympics as many of the young sailing athletes aspire to one day be participants in this most prestigious event. Of course, there are only a few that are able to reach that level, but that doesn’t take away from the excitement and the challenges that come with trying to qualify. Even though there may be many that don’t make the Olympics they take great pride in their accomplishments. The Olympics is not only important to the participants but equally important to the fans such as those who take great pleasure in following the sailing events. 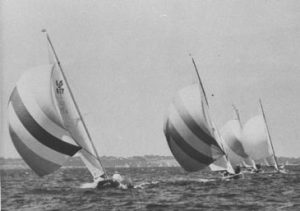 Sailing is popular for many fans and this is evident by the large turnouts at various competitions and events like the Olympics. There are some who just like to sit on the beach and take in the great sailing activities that are taking place before them.